ABOVE: Visitors get face time with fish on the lower level of the Oceanário's huge central tank. Lisbon is the capital of a nation with a long maritime tradition--and after centuries of dispatching ships across the world's oceans, it's only fitting that Lisbon has now brought the ocean to the city. The Oceanário de Lisboa, or Lisbon Oceanarium, is is the second-largest aquarium of its kind in the world (and the largest in Europe). The centerpiece of the Oceanário is a huge two-story tank where small fish, eels, sharks, a giant ocean sunfish, and other creatures swim around a reef without eating each other. Other sections of the Oceanarium, some of which connect to the main tank, feature sea birds (such as penguins and puffins) and sea otters. It's the kind of place where you can easily spend a couple of hours, even without taking part in special activities such as "Backstage Tours" or "Sleeping with the Sharks" (an overnight slumber party for children or families). 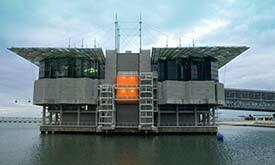 ABOVE: The Oceanário de Lisboa's exhibit building is surrounded by water. Its design resembles "a docked ship, ready to cast off." Location: The Oceanário de Lisboa is in the Parque das Nacões, a modern district on the eastern edge of Lisbon. Once you reach the park, head for the Tejo (Tagus) riverfront, where you'll find the exhibit building at the south end of the Doca dos Olivais. (See photo at top of page.) The ticket office, gift shop, and cafeteria are in a separate building on land, with an enclosed pedestrian bridge crossing the water to the exhibit halls. Public transportation: Long-distance CP Portuguese Railways trains, Sintra-Lisbon-Azambuja commuter trains from Santa Apolónia Station, and subway trains of the Metropolitano de Lisboa's Red Line stop at the Oriente railway station. From the station, walk toward the river. The oceanarium is a short distance west of the Pavilhão Atlántico arena and concert hall. Accessibility: The Oceanário is easy to navigate with a walker or in a wheelchair (as is the entire Parque das Nacões, which is the only fully accessible district of Lisbon). 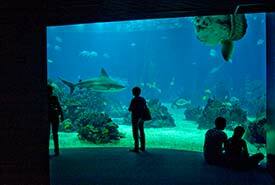 Current hours and ticket prices: See the English-language Oceanário de Lisboa Web site. 2nd inset photo copyright © João Saraiva.